his tree is an excellent candidate for indoor growing. This plant forms aerial roots with ease in moist conditions which gives each tree its own character. The aerial roots come from the side branches and from old bark under a heavy foilage canopy with high humidity. This tree originates from Southeast Asia and in nature can attain a height of over 50 feet. This tree typically grows in a multitrunk style with a wide canopy. The typical leaf is oval with a slight point. The bark is gray and smooth. 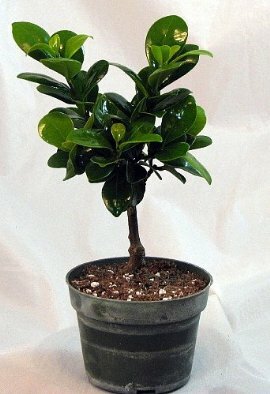 The green island ficus produces a fig approximately 1/3 to 1/2 an inch in diameter. The figs start out green and mature to red before turning black and falling off. The seeds are not considered tasty to humans, but birds will eat the fruit. Seeds on an indoor tree are reported to be infertile due to the absence of the fig wasp that is needed to pollinate the figs to seed. As do most bonsai, the green island ficus will do best in bright light, but will also grow under fairly dim lighting conditions. For the best results try to keep the tree in the brightest location in your home. Give the plant as many hours of sun as you possibly can. Try to avoid full mid-day summer sun if you keep the plant outside. The perfect condition for this plant is outside under a screened enclosure. Mist your tree often or use a water/moisture tray for added humidity.